Two driven rolls 2½" diameter by 24" long (64 mm × 61 cm). Clay is sandwiched between canvas strips, then cranked into the machine. 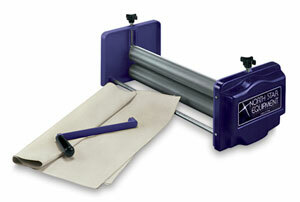 Knurled rolls grip canvas and pull slabs through easily. Wet slabs can be moved on the bottom canvas. Two-roll system gives least warping in kiln. Infinite thickness adjustment from 0 to 2½" (64 mm) with no shims or boards. Polaris accepts texturing materials, press molds, and makes tapered slabs. Roll opening and handle can be locked in place. Full five year warranty. Furnished complete with canvas and mounting hardware. Shipping Weight 35 lbs (16 kg). Tabletop — Made of 3/4" thick, moisture-resistant medex with a melamine surface, this tabletop provides a stable surface beneath the Polaris Slab Roller when used on a countertop. It assembles in minutes with no tools, and comes with non-slip grip tape that prevents the tabletop from shifting or moving while rolling slabs. Measures 24”W x 24”L x 3”D.  North Star is a trademark.